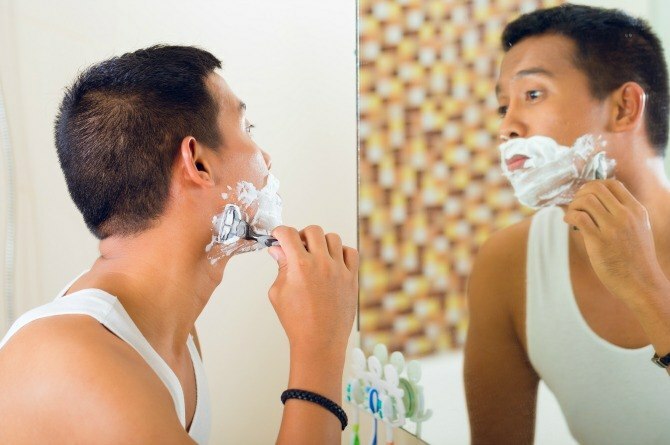 Find out why you should rid your daily routine of these five nighttime grooming habits! Listen up, dads! Now, you may think your usual nighttime grooming regimen is doing wonders but sadly, it most likely isn't. Though the five things on this list are effective grooming techniques, there are reasons why they are best left for morning. These habits, when done before sleeping, can not only affect your skin, they can negatively influence your overall health, mood, and energy levels. Here are five habits you should save for the daytime! There's no fixed rule that you shouldn't shave a night. But if you get into the habit of doing so, you'll usually wake up with a little bit of stubble in the morning so you'll have to repeat the process. Get up a little bit earlier than usual and use warm water to moisten your face. You don't want to be rushed and accidentally nick yourself, which usually happens if you wake up late. Use plain water when washing your face or choose the right cleanser. Why? Certain soaps which don't address your skin's needs may be doing more harm than good, causing: irritation, redness, or acne. Figuring out your skin type will help you choose the right cleanser for your skin. For instance, if you have sensitive skin, gentle non-foaming cleansers may be your best bet. Whether or not you use a cleanser, washing in the evening is very important. Who wants to sleep with the day's gunk on their face, right? More bedtime grooming rituals to avoid on the next page! Much like choosing the wrong cleanser, using the wrong moisturizer can cause adverse reactions. Daytime and nighttime moisturizers are different. And there are more effective types for each skin type. According to research, sleep causes new skin cells to grow, that's why a proper facial routine before bed is so important. Using moisturizer rids your skin of the day's pollution and stress. It also hydrates the skin. Sure, it may be relaxing and hygienic but can actually mess up your sleep cycle. Showering before bed may cause your core temperature to rise thereby hindering your sleep. Normally, your body temperature drops to help you fall asleep at night. But when you take a hot shower, you need a certain amount of time to cool down before you can doze off. Brushing--alone--apparently isn't enough. Many people neglect to floss but it's actually an important part of caring for your teeth and gums. It's best to floss at the end of the day and it's the easiest time to do it. If you don't get into a habit of flossing away the food you had throughout the day, you may develop tartar and cavities. Preventing gum disease starts with this healthy habit. Revealed! Chote Nawab Taimur Ali Khan Pataudi has the CUTEST nickname!